A really original game that is extremely easy to learn. The deductive element encourages detailed analysis and note-taking, yet intuitive leaps are also rewarded, making it suitable (or unsuitable, if you're a sour sort) for mixed groups of gamers and non-gamers. The strong theme also shines through. An exciting mystery/deduction game. Days of Wonder always does a great job with components and theme. If you like deduction games this one is a must for you collection. This is a great family game. Enjoyed Clue as a child? How about a grown-up version? Mystery of the Abbey is very much that, with a great deal more involved. The premise is similar - who killed the monk - but combined with an intriguing map, global effects, and an infinite realm of player questioning. This is a beautiful and fun game that promotes deep thinking and entertainment. This is Clue, but many levels better. The murder takes place in a monastery. The suspects are the murdered monk's colleagues: other monks. You go around the monastery searching for clues, and you deduce which monk is the murderer by whether they are clean-shaven or not, hooded or not, thin or fat, and tall or short. Good gateway game. There are notepads for your players. Days of Wonder makes good games esp. those that want to get into boardgames. 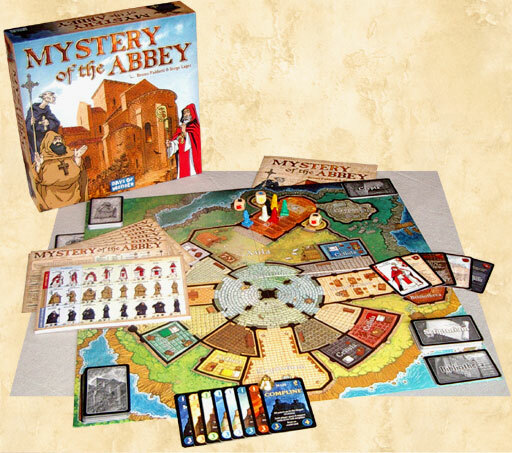 Mystery of the Abbey is the most thematic deduction game I've ever tried. The setting, the bell, the miniatures - it all blends perfectly with the mechanics. What really makes Mystery of the Abbey stand out, however, is that you have a great deal freedom in how you gather information, since you have to phrase your questions yourself. This requires some skill and reasoning ability, which is what gives this game longevity - you really feel that you are improving when you play it more often. Adding the included Pilgrims cards is also a nice option if you should have played the base game so much that you want a bit more spice.